MEMPHIS, Tenn. (localmemphis.com) - A new concept restaurant that aims to feed the need as well as customers is set to open in the former location of Stanley BBQ in Overton Square. Stanley BBQ, which had been in the space, closed back in February. 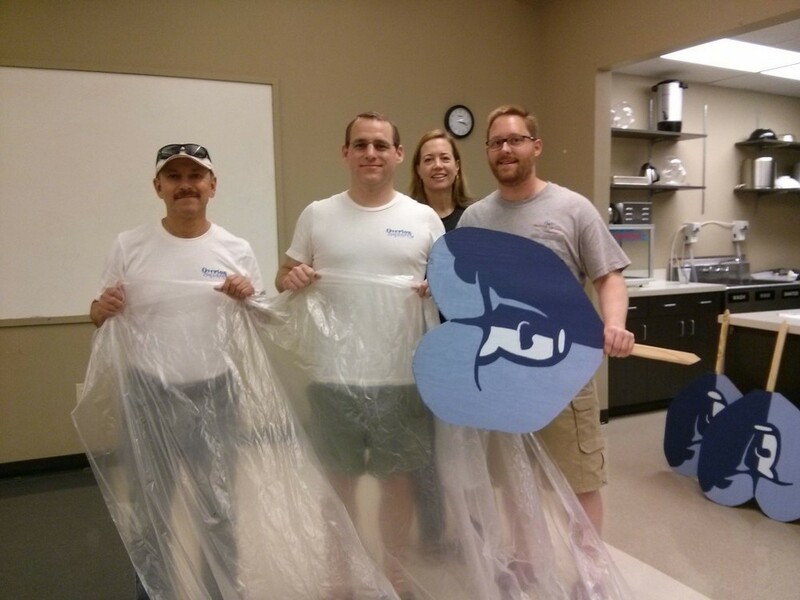 Loeb Properties employees love helping in the community, especially with The Carpenter Art Garden. 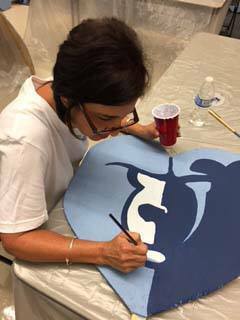 We recently spent some time there with Donte, the artist of the Grizzlies Yard Hearts. Donte is a talented young man! "In the heady 1970's days, T.G.I. Friday’s was the heart of the district; revelers often stood three deep at the bar, ramping up their rowdiness for the weekly wet T-shirt contest. Other eateries and clubs — Silky Sullivan’s, Bombay Bicycle Club, Lafayette’s Music Room — also packed in the crowds, while retailers sold candles and body oils, antiques and art, trendy gifts and funky furniture. But the real attraction was the atmosphere itself, fueled by liquor, live music, and the hormonal exuberance of 20-somethings ready to party. Clearly they are seeing that now. Though Overton Square’s popularity faded in the 1980s and by the twenty-first century showed dimming signs of life, the now-bustling district boasts growing occupancy of properties along Madison and its environs. Patrons, some who were at the Square in its heyday and others who weren’t born then, relish the revival of a Memphis institution." 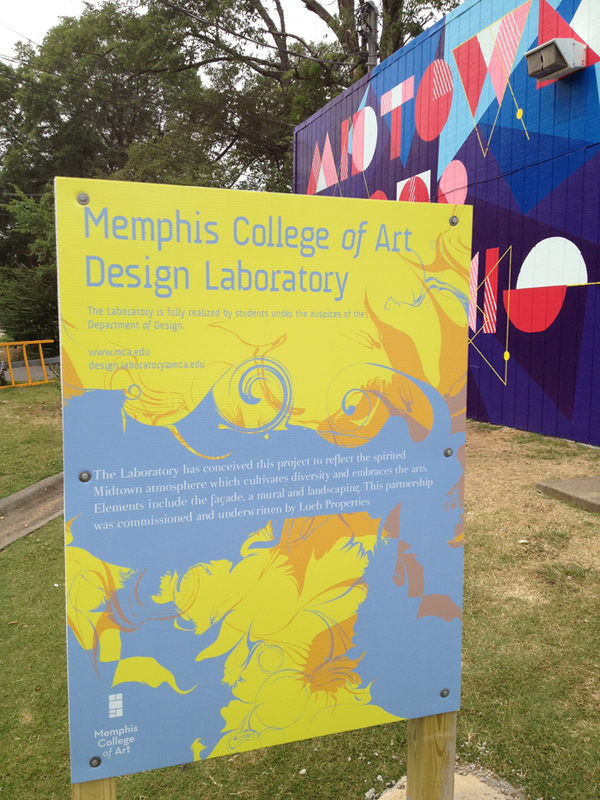 The service station at 1923 Poplar faces Overton Park and neighbors one of Midtown’s cultural mainstays, Memphis College of Art. In an effort to brighten up a very visible Midtown corner, Loeb formed a partnership with MCA, and a plan was devised to paint a mural on the east-facing side of the building. Visible driving east on Poplar, the bright colors and happy message are a welcome addition to the neighborhood. We first discussed our main objectives, that the mural should be about Midtown and legible while driving down Poplar Avenue. After exploring what we thought captured the spirit of Midtown Memphis, we decided to create a survey to compare our thoughts to others. They were essentially one in the same: that Midtown is lively and blooming. 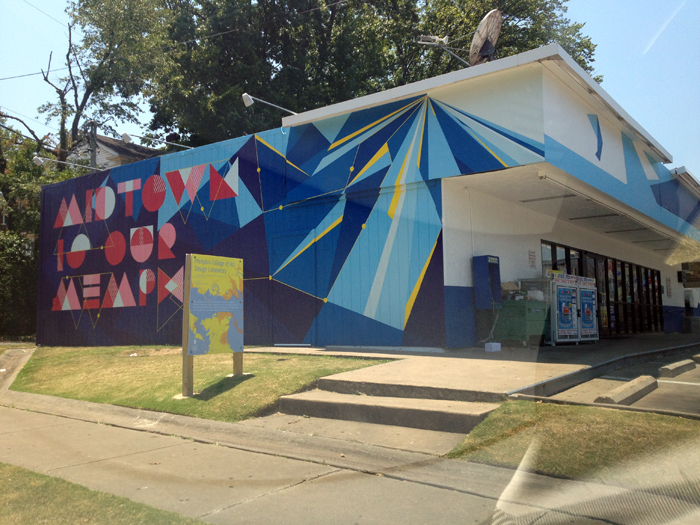 After some deliberation, we felt the mural should have an upbeat Midtown message, which we wanted to portray through geometric forms and bold colors. 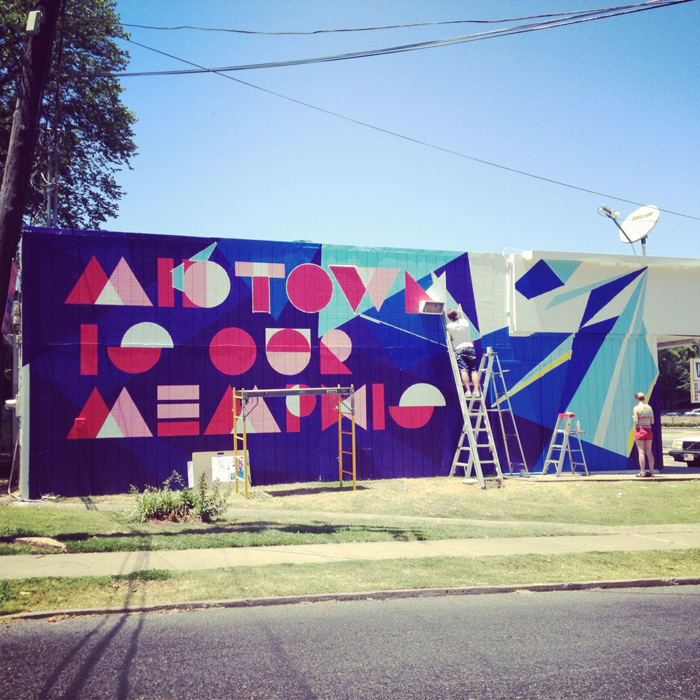 We chose the text “Midtown is Our Memphis” to transform the original “Midtown is Memphis” expression from an exclusive phrase into an inclusive one.